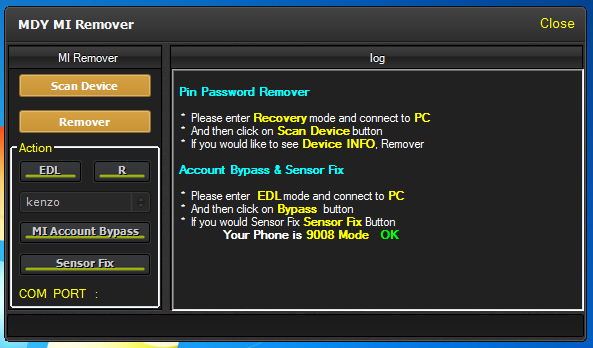 Mi Account Unlocker & Sensor Fix Tool Download Free. MI Account unlocker software free download for windows. MI Account unlocker software allow you to unlock your MI REDMI XIAOMI mobile phones and it is completely free to download and very simple to use. It's also allows you to Fix the sensor problem in Mi smartphones this will also help you to reboot Mi device into Emergency Download Mode. So if you want to unlock your MI phone using this useful utility tool then just download and install MI Account unlocker software on your windows PC and start unlocking your MI phones now. It's a small tool and very easy to use just download the Mi account unlocker and sensor fix tool from our blog and extract it by any RAR extractor. Power off your device . Now press and hold Volume Up+Power button. While Device show MI logo release Power button.But don’t release Volume up button. on the software- first Click “Scan Device” it showing your device information.